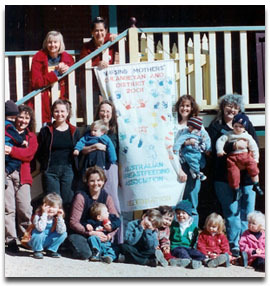 The Australian Breastfeeding Association (formerly known as the Nursing Mothers' Association of Australia) is a voluntary, self-funded organisation, which encourages and supports breastfeeding mothers and their families. mother-to-mother support to all families. Australian Breastfeeding Association volunteers also provide support to our local community whenever possible by conducting feed and bath demonstrations at Bungendore Public and Pre-Schools, Mothers' Day luncheons at Bungendore, establishing feed and change rooms or tents at events such as the Bungendore Show and Bywong Business Fair and other events where young families look for respite from the weather, facilities to change babies and young children, or just somewhere to sit quietly to feed and rest. Enquiries are always welcome and our local volunteers are happy to provide friendly introductions to community networks.